Rediff.com » Business » Another shocking jobs data revealed! Another shocking jobs data revealed! According to NSSO, more than half of India’s working-age population is out of labour force. In 2017-18, the youth unemployment rate was in the range 13.6-27.2 per cent. Half of India’s working-age population (15 years and above), for the first time, are not contributing to any economic activity, according to the National Sample Survey Office’s (NSSO’s) latest jobs survey. The labour force participation rate (LFPR) - the share of the population who are either working or available for work - stood at 49.8 per cent in 2017-18, falling sharply from 55.9 per cent in 2011-12. More than a decade ago, in 2004-05, 63.7 per cent of the population was part of the labour force. This was part of the findings of the NSSO’s periodic Labour Force Survey Report for 2017-18, which has been withheld by the government and reviewed by Business Standard. “It’s a serious cause of worry as you are unable to utilise the demographic dividend factor - especially keeping in mind the fact that 65 per cent of the population is in the working age group,” said Radhicka Kapoor, senior fellow, Indian Council for Research on International Economic Relations. In 2011-12, however, the decline in the LFPR was higher (by 11.5 percentage points) than what was observed in 2017-18. The proportion of the active labour force declined twice for females between 2011-12 and 2017-18 in the age group 15 years and above. Compared to 2011-12, the LFPR for females fell by around 8 percentage points to 23.3 per cent in 2017-18, whereas the LFPR for males dipped by 4 percentage points to 75.8 per cent in 2017-18. So, only about a quarter of the females in the country were either working or seeking jobs. The fall in the LFPR was far more in rural areas (from 67.7 per cent to 58.7 per cent) than in urban areas (from 49.3 per cent to 47.6 per cent), according to the 2017-18 report of the NSSO. Significantly, the gap in the LFPR has narrowed between urban and rural areas due to a big dip in the active labour force in villages. “Education plays a big role in the declining size of the labour force. But case studies and field reports also suggest that lack of suitable work, especially for women, is not readily available. Though the female LFPR in urban areas remained almost at the same level (20.4 per cent in 2017-18), it declined sharply by more than 11 percentage points in rural areas. 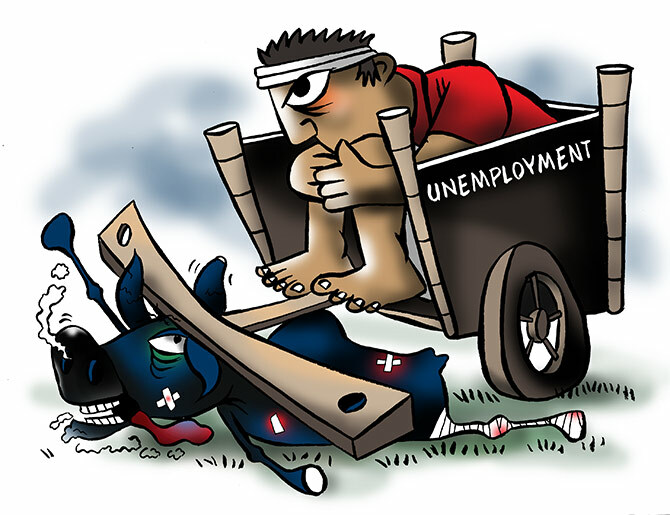 Economists point out a falling LFPR, coupled with a high rate of unemployment in the country, is cause for worry. The unemployment rate, according to the NSSO report, stood at a 45-year high of 6.1 per cent in 2017-18. This was three times the unemployment rate witnessed in 2011-12 - the last time when the NSSO conducted a household survey on jobs. The LFPR for the youth (in the age group of 15-29 years) stood at 38.2 per cent in 2017-18, compared to 44.6 per cent in 2011-12. In this age group too, a fall in the female participation rate (by 8 percentage points) in the labour force was higher than what was seen among males (by 4.8 percentage points). Importantly, the unemployment rate for the youth also shot up two-three times, compared to 2011-12. In 2017-18, the youth unemployment rate was in the range 13.6-27.2 per cent. Kapoor said an enabling environment for productive jobs and focus on employment, rather than gross domestic product, might help address the trend of a falling LFPR. Business Standard reported last week the LFPR at the national level fell from 39.5 per cent in 2011-12 to 36.9 per cent in 2017-18. However, according to the NSSO report, this was for all age groups (five years and above).